For other ships with the same name, see HMS Eagle. HMS Eagle was a 58-gun fourth rate ship of the line of the Royal Navy. Eagle was built by shipwright John Barnard at Harwich Dockyard in 1744-45. The contract for construction was issued on 10 April 1744 for a vessel named Centurion, a fourth-rate ship of the line to be built according to dimensions laid down in the 1741 proposals of the 1719 Establishment. Her keel was laid on 24 July 1744, and on 15 November she was renamed Eagle to make way for the recommissioning of her namesake, Admiral Anson's flagship, which was returned to active service. She was originally designed to carry 56 guns with an upper and lower gun deck each carrying 24 24-pounder cannons, eight 6-pounder cannons on her quarterdeck and two additional 6-pounders mounted on the forecastle. Two more 24-pounder cannons were added to the upper deck prior to launch in 1745. Eagle was launched on 2 December 1745. She was under the command of George Rodney between 1747 and 1748 during the War of the Austrian Succession. Eagle is also notable as being the ship in which James Cook began his career in the Royal Navy, serving from 1755 to 1757 as able seaman, master's mate and finally boatswain under Captain Joseph Hamar for his first year aboard, and Captain Hugh Palliser thereafter. Eagle was sold out of Navy service in 1767. ^ In purchasing power, this equates to a relative value of £2.18m in 2014 terms. ^ a b c Lavery, Ships of the Line vol.1, p172. ^ "Purchasing Power of British Pounds from 1264 to Present". MeasuringWorth. 2015. Retrieved 30 August 2015. ^ Robson, John (2009). Captain Cook's War and Peace: The Royal Navy Years 1755-1768. University of New South Wales Press. pp. 19–25. ISBN 9781742231099. HMS Victory was a 96-gun second-rate ship of the line of the Royal Navy, built to the dimensions of the 1733 proposals of the 1719 Establishment at Portsmouth Dockyard, and launched on 23 February 1737. Centaure was a 74-gun ship of the line of the French Navy, launched at Toulon in 1757. She was designed by Joseph-Marie-Blaise Coulomb and named on 25 October 1755, and built under his supervision at Toulon. In French service she carried 74 cannon, comprising: 28 x 36-pounders on the lower deck, 30 x 18-pounders on the upper deck, 10 x 8-pounders on the quarterdeck, 6 x 8-pounders on the forecastle. The 1745 Establishment was the third and final formal establishment of dimensions for ships to be built for the Royal Navy. It completely superseded the previous 1719 Establishment, which had subsequently been modified in 1733 and again in 1741. 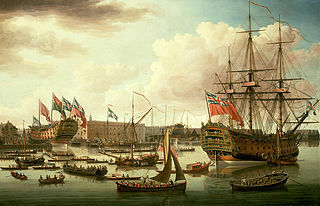 Although partially intended to correct the problems of the ships built to the earlier Establishments, the ships of the 1745 Establishment proved just as unsatisfactory, and important changes in the make-up of the Admiralty and Navy Boards finally led to the end of the establishment era by around 1751.